Sabermetrics is derived from the acronym SABR used for the Society of American Baseball Research. 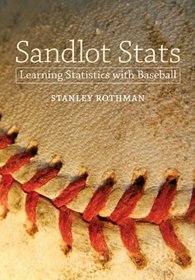 Sabermetrics is the science that uses baseball data to form statistics allowing baseball people to make objective baseball decisions. In the past most general managers just followed what previous general managers did in making crucial decisions. However, as the amount of money paid to players increased exponentially it became necessary to make important player decisions based on objectivity and not subjectivity. Bill James is credited with beginning these studies in the 1980s. Enter Billy Beane who was a 5-tool high school baseball player who could not make it in the majors and decided to become a baseball scout at the age of 27. All of this is chronicled in the book and movie Moneyball. With the help of Paul Depodesta, Billy Beane the general manager of the small budget Oakland Athletics used sabermetric analysis to lead Oakland to an amazing 20-game winning streak in 2002. His success came from his ability to look for undervalued players who excelled in undervalued statistics. This allowed him to sign players on the cheap who possessed metrics other general managers ignored. Billy Beane’s success at Oakland year after year has led most major league teams to eventually see the light and create their own sports analytic departments to objectively evaluate players. Today, Billy Beane believes the next frontier of analytics is not about statistics measuring on-field performance but instead on keeping players on the field. In fact Billy Beane, now vice president of baseball operations for Oakland, has been one of the loudest voices touting player injury prevention. The term PHM (population health management) has now appeared in baseball circles. Healthcare metrics are being introduced to analyze the causes of injuries which will hopefully lead to their prevention. Healthcare data mining and baseball Sabermetrics have more in common than one might think. Both want to notch some big wins and both healthcare and baseball are faced with greatly increased costs which must be controlled. Neil Kudler, MD, showed how healthcare can learn from Moneyball how to use large amounts of data to make objective decisions on injury prevention. Like baseball, for many years healthcare was dictated by handed-down wisdom of the past without using newer available data. Kudler’s novel approach is to create measurements in a way similar to baseball. In baseball, some of these metrics are OBP (on-base percentage), SLG (slugging percentage), and OPS (on-base plus slugging). Dr Kudler argued that population health management has to be an evidence-based team sport. Some of Kudler’s metrics are POP, AC, RM, and ERR. Below is how Kudler links his health statistics to baseball statistics. POP is the population health management (PHM) team’s win/loss percentage equal to their total patient population kept under control divided by their total patient population. The players on a PHM team are the primary care physicians (PCPs). Their statistics are: AC is the PCP’s on-base percentage equal to their total number of patients that did not get better or worse (stayed the same) divided by their total number of patients. RM is the PCP’s slugging percentage equal to their total number of patients that got better divided by their total number of patients. ERR is the PCP’s error percentage equal to their total number of patients that got worse divided by their total number of patients. These metrics are applied to two physicians in a PHM group. Dr. Smith handled 250 patients from period 1 to period 2; his AC=146/250 =.584; his RM=44/250=.176; his ERR=60/250=.240.Dr. Jones handles 300 patients from period 1 to period 2; his AC=215/300=.717; his RM=45/300=.150; his ERR=40/300=.133.